Year round training is offered at UIC. We offer 4 sessions throughout the year. Fall (September-November), Winter (December – February), Spring (March – June), and Summer (June & July). Session Program information will be posted for each session as soon as it becomes available. Please print off the below forms and bring with you to your first practice at UIC. 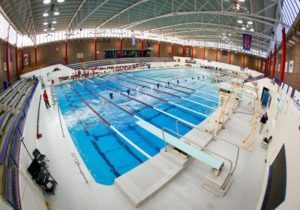 The UIC Facility has 2 1-meter Model “B” diving boards which are mounted on cement stands. And there are 2 3-meter model “B” diving boards that are on Durafirm Stands with 16 feet of water and a portable sparging, “bubble” system. Divers who participate at this training site also have use of the UIC Diving Dryland room which features a trampoline and dry board with foam pit. The dryland room is located directly behind the pool.